This session brings the members of each work package together to share their progress and learning and prepare a presentation to share the purpose, activity and learning from the work packages. Why did what you did matter? 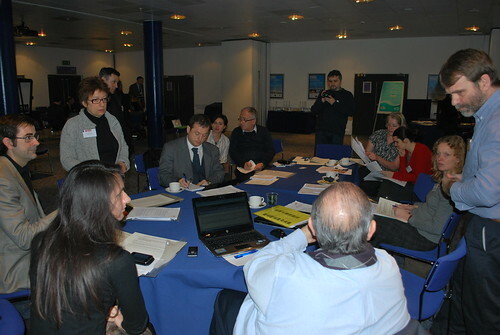 What can you conclude about meeting the high level objectives of the CASC project? There is no science museum in the region, no scientists, and a lot of people without access to the internet. A significant number of people in rural areas not accessing media, or even reading a newspaper. The project used traditional media, such as flyers and posters, to access those hard-to-reach groups and engage people with the science day. 2. A mixed-ability competition in Cyprus. The team in Cyprus created FameScience – a talent show for promoting science and mathematics. The contestants were tasked with explaining a scientific phenomenon in under three minutes to non-experts. This helped to develop learning materials, such as cartoons and videos and was a move away from the traditional methods. 3. An exhibition in a shopping mall in France. The idea was to go where the general public was, rather than target specific populations as it was difficult to identify the hard-to-reach groups. The team is planning to open a public cafe in the middle of a city so that everyone can access science. The Swedish group set up a science exhibition in a shopping mall which focused radiation in mobile phones. The idea was to focus on an area people would be interested in, and was relevant to people’s lives. Birmingham’s Thinktank took objects from the science museum to care and nursing homes to engage with elderly people. The project was a success and helped Thinktank to learn how to work with this hard-to-reach group. Everybody is a hard-to-reach group concerning science. How do you define a hard-to-reach group? There isn’t a common European policy due to differences in defining hard-to-reach groups. You can mix the objectives with leisure activities to attract people. We can reach people in schools – the captive public. Hard-to-reach groups in France are the non-captive groups not present in places such as schools. People that go shopping in the day during the week may be more likely to be the hard-to-reach groups. We need people that are experts in training and science communication… so when we talk about science, people will be listening as they are able to understand. ‘Relevance’ is a key word. Hungary – Secondary school is too late to convince people to go to university. Tried primary school, perhaps also too late. Had to start at kindergarten to link people to science and start the process of engaging students. Focused on trying to clearly define our publics. The groups had different visions and definitions of the public. This entry was posted in Families, Final Conference, General Public, Innovative ways of engaging people in science, Older People, Public, Women and tagged communicating science, public engagement, public understanding of science, science education, social engagement. Bookmark the permalink.